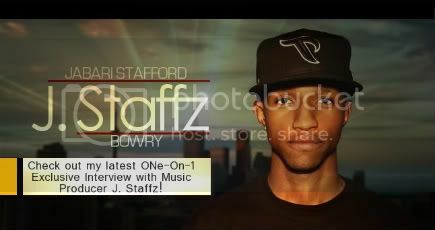 This edition of One-on-1 features 25-year-old Music Producer Jabari “J Staffz” Bowry! J Staffz as he is respectively known as in the music industry, is not only a Producer, but a Recording Artist, DJ and Engineer from Toronto, Canada. He’s worked with Artists such as Wiz Khalifa, G-Unit and Yung Berg, and it doesn’t look like he’s slowing down anytime soon! Read on to check out this Exclusive Interview with the man himself, J Staffz! Check out "She Wants Me" by Cardybaby, Produced by J. Staffz! J Staffz! I'm so excited to get the chance to speak to you! Thank you for your time! Thanks so much. I really appreciate the chance to be on your site. Are you kidding? It’s my pleasure (lol)! As you know, I have a lot of questions for you that I can’t wait to get into! So far starters, I know that you Produce beats, how long have you been doing that? I’ve been making beats since I was 15 year old. So you’ve been at it for a few years now. Which genres of music influences your style? Who are some of your biggest inspirations when it comes to your work? I love classical music. I love cool chord progressions and string sections. I really love the production by The Neptunes as well. Yeah, the Neptunes are dope. I wouldn’t have thought you’d be inspired by Classical music though. Especially since the beats you make are primarily hip hop. Do you play any instruments, and do you take part in any other aspect of the music business? I rap and sing. Not that I want to do them as a career. I make beats and I have my own studio so it’s easier for me. Recording other artists all the time taught me a lot. I've been playing piano for 18 years. I also play the drums. Wow, you wear many hats. Now, I know that you’ve worked with Wiz Khalifa, G-Unit, Yung Berg, 40 Glocc, and The Cokeboys just to name a few. These are some really big names, how did these collaborations come about? Wiz Khalifa was about an hour from my house in the summer of 2009. So I went out to see him and Boogz Boogetz and we did 2 songs. They put Yung Berg on the second song. Some stupid bootleg producer from New York stole my beats and gave them to G-Unit and they ended up doing a bunch of records to my beats. I met one of the Cokeboys on twitter and just kept in touch and got the opportunity to work with the whole group eventually. That’s crazy! 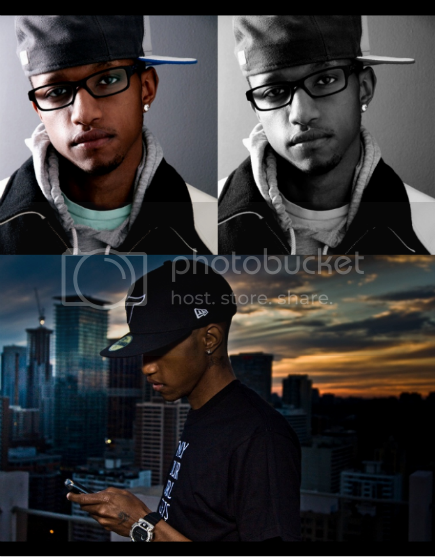 I guess a negative turned into a positive as far as your beats getting stolen (lol). Everything else is either pure luck or God’s blessings, depending on how you look at it. Speaking of God, what role does he play In your life? I think he's completely responsible for where I came. He keeps pushing me further and further and providing me with better and better opportunities. I'm just glad I get to do something I like and make money. That’s what’s up! So, do you have a strong support system behind you? How does your family feel about your success? My family is cool with it. Its basically their fault. My dad is a DJ and my mother sings so there’s always music in my house. I remember the day my dad heard my song on the radio. They love it. That‘s really cool, having a supportive family means everything when you‘re pursuing your dreams. So, off the music for a sec, what kind of example would you like to set for the new generation of youth wanting to make it in the field of their choice, Music, or any other profession? Make sure they're serious about what they want to do and make sure they invest in themselves. That’s a great answer! Usually if you’re scared to invest in yourself, you probably aren’t truly passionate about what you’re doing. Now, you’re quite established. How did you get so popular so fast? Lots of things. I put out songs every other day so I guess the word spread fast from just my work ethic. Investing in trips and going to parties to network and be around people who can push my music further then I can. Also having my music all in one place (www.ProducedByJStaffz.com) and getting my beats out to people who need the help by doing sales for cheap. Twitter helped a lot as well. So you really just spread yourself around a lot! An obviously effective method. What has been your biggest moment so far? My biggest moment has probably been meeting all the artists that I looked up to. Its a toss up between that and hearing my beats on TV and Radio. I don't think I'll ever get tired of hearing my music on the radio or on TV. I don’t blame you, you work hard for that! Do you have any big and exciting new projects coming up in the new future? I just have my mixtape called The Staff Meeting 2 coming out. Its featuring Wiz Khalifa, G-Unit, Yung Berg, 40 Glocc, The Cokeboys and a few artists I'm working with, as well as other records I've done. I’ll definitely be on the lookout for that! So my last question is a simple one, what is your greatest ambition? I REALLY want a Grammy. Or 2. You’ll most definitely get there! Keep pushing the way that you have been, and I’m sure we’ll all be seeing you on that stage! Thank you so much for speaking with me, and please keep me updated on your success! Everyone be on the lookout for J Staffz new mixtape "The Staff Meeting 2", and be sure to connect with him on all of his social networks!